I’m still trying to wrap my head around the President’s energy speech yesterday. I get the goal: Reduce oil imports 30 percent in a decade. But what I don’t get, at all, is the plan to achieve that goal. The President’s “Blueprint for a Secure Energy Future” doesn’t make any sense. Consider, for example, his “Blueprint” for oil. It’s all over the place. So, the President believes that “meeting this new goal…depends largely on…finding more oil at home.” But “finding more oil” necessarily requires more drilling. How is this different from “drill, baby, drill,” which the President only moments before had denigrated? In this passage, the President was citing a highly politicized report that the Department of the Interior had issued a day earlier, claiming that more than 50 percent of oil and gas leases were “idle.” Setting aside the absurdity of the notion that energy companies are intentionally forgoing profits by sitting on valuable reserves, the Department of Interior report omits mention that many of these leases are idled because the Interior Department won’t approve exploration plans. That is, they are idled due to the Interior Department’s delaying tactics. These sorts of machinations, writ large, have reduced oil production in the Gulf of Mexico 300,000 barrels a day. To recap the madcap: First, the President mocked “Drill, Baby, Drill.” Then, he recommended “finding and producing more oil at home,” which is synonymous with “Drill, Baby, Drill.” Finally, he pitched a plan that is in fact political cover for his Administration’s de facto moratorium on domestic energy production. 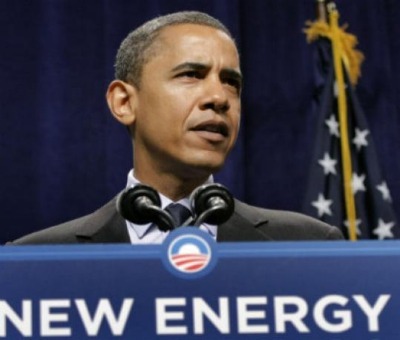 At the outset of his energy speech, President Obama said that he intends to “get serious about a long-term policy for secure, affordable energy.” He proceeded to describe a wacky oil “Blueprint” that is far from serious.